From left, Gov. 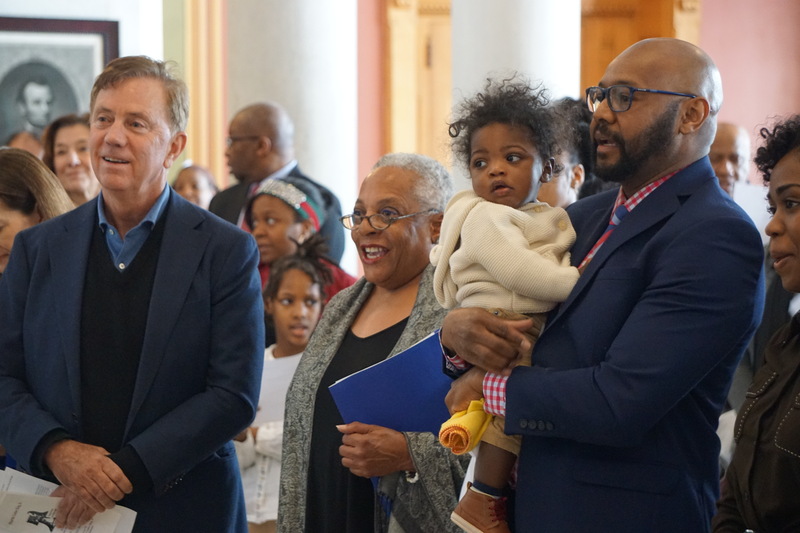 Ned Lamont and two honorees at an MLK Jr. celebration, Elizabeth Horton Sheff and Steven Hoffler, an SCSU professor. Connecticut politicians on Monday cast contemporary debates over immigration, a $15 minimum wage, paid family and medical leave, school integration and early voting as the legacies of Martin Luther King Jr.’s crusades for social, economic and racial justice in the 1960s. With comments both oblique and direct, Democratic elected officials used King’s memory to rebuke President Donald J. Trump, whom they described as the antithesis of King and his fights for voting and economic rights for disenfranchised Americans. Lamont was one of a half-dozen Democrats addressing an audience of more than 1,000 at the 34th annual MLK Scholarship breakfast organized at the Connecticut Convention Center by Delta Sigma Theta, the African-American sorority. “We will build bridges, not walls, in this great nation,” U.S. Sen. Richard Blumenthal said. More than a half century after King’s death and on the 90th anniversary of his birth, King is very much present in public life, his legacy subjected to endless interpretations about where he would stand on the issues of the day. Treasurer Shawn Wooden, the state’s only black statewide elected official, noted King’s emphasis on economic justice near the end of his life, an issue that resonates deeply in Connecticut, a state of great wealth and poverty. 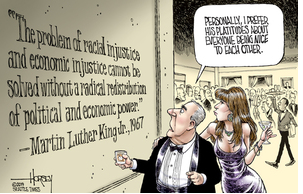 Hartford Mayor Luke Bronin, the white Ivy-League educated mayor of a minority-majority city, embraced the more aggressive and less quoted side of King, warning against letting King be remembered only for conciliatory platitudes, not his sharper and more challenging assessments of privilege and poverty in the U.S.
Click on cartoon to see enlarged version on cartoonist’s site. Lamont, Blumenthal, Bronin, Wooden, Lt. Gov. Susan Bysiewicz and U.S. Sen. Chris Murphy addressed the breakfast audience, then fanned out across the state for other observances. At the State Capitol, Lamont, Blumenthal, Bysiewicz, Wooden, Secretary of the State Denise Merrill and Attorney General William Tong attended the 33rd annual National Liberty Bell Celebration. Officials rang the Liberty Bell replica on display in the Capitol’s main floor. Merrill said her proposal to allow early voting in Connecticut is in King’s tradition of easing ballot access. She said her dream was that everyone eligible to vote would register and turn out. The governor was gone, on his way to an MLK event in New Haven, when Horton Sheff addressed the audience, reminding them that the Sheff plaintiffs were still in court, fighting over the definition of segregation. 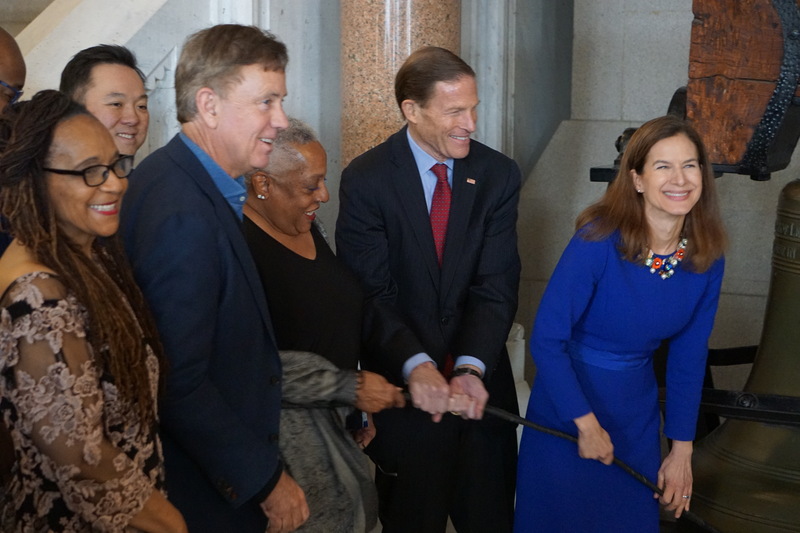 Ringing the bell: From left, Donna Campbell of MLK Jr. Holiday Commission, William Tong, Ned Lamont, Elizabeth Horton Sheff, Richard Blumenthal and Susan Bysiewicz.